Since becoming a mom I have learned many useful tactics to help me have smooth-sailing successful days. I wanted to share one of those with you today. I have learned to use bribery in certain situations to cease the whinning, screaming, fighting, or any non-compliance that I may face daily as a mom of three girls under four years of age. Now, I want to reassure you that I am not recommending this for ALL situations. I feel strongly about disciplining children in a way that they learn right from wrong, while realizing that they alone control their actions. I try to teach my girls that they can choose how they respond to certain situations. I explain that things don't always go their way. But that they need to adjust and NOT pout, moan, complain or grunt everytime they are asked to do something they don't feel like doing. This, my friends, is where my AMAZING use of reverse psychology, brainwashing and trickery come into play. 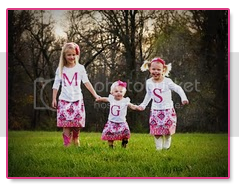 I wanted to have a mini photo session while the girls were all dressed up before visiting the Easter Bunny. Notice the following three pictures.....especially Sophie. Note the SMILING cheerful glee that both girls express. Could they be any happier?! Amazing what a few jelly beans will do for a photo session! If all else fails, pull out a few jelly beans to say, "I appreciate when you listen to Mommy! Here is a reward!" Like I said, I don't always resort to this. I do want my kids to learn to just do as I say sometimes without needing a prize. But it is nice to have the option in certain situations! Bribery is okay in my book. As an adult you go to work and if you do a good job you get a paycheck. Bribery. The American way.